Thunderbolt and lightning, very very frightening! The day’s storms must have frightened most people off, but those who ventured out had a lovely evening with just enough of a breeze in the car park to keep the midges at bay. It was a little slippy under foot, prize for collecting most mud goes to Olivia – spectacular amount all over map and brikke as well as feet, legs and arms! Nice to see some new faces – keep coming (but not next week, we’re having a break. 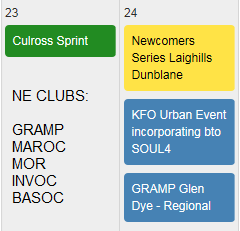 Next event is Back o’Bennachie on 3rd August)! Thanks to the Caffyns for planning, and to control collectors Rachel, Rob, Genevieve and Joe. Just to say thank you to Dave Kirk for not using me as a carpet while I was lying prostrate on the slippry slope from 6 to 7. Must have been very tempting to try and get some grip while scrabbling up that muddy slope.